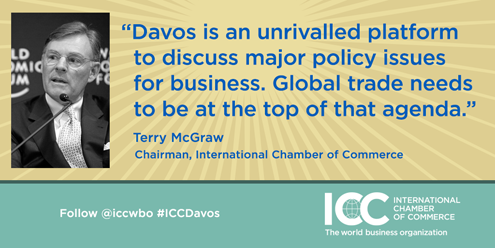 International Chamber of Commerce (ICC) Chairman Harold (Terry) McGraw and Secretary General John Danilovich join prominent business leaders and over 40 heads of state or government at the annual World Economic Forum (WEF) which begins in Davos, Switzerland today. With an expected record 2,500 participants from more than 140 countries, this year’s gathering takes place under the theme ‘The New Global Context’ and will address global concerns and risks from corruption to climate change. Providing insight and opinion on behalf of the world business organization, the ICC leaders are set to engage in a full schedule of speaking engagements and meetings during the four-day event. They include discussions on business priorities to help advance the G20 agenda with Turkish Prime Minister Ahmet Davutoglu, and an ICC-hosted open discussion with World Trade Organization Director-General Roberto Azevedo on the post-Bali trade agenda and the role of business in maintaining momentum on international trade. ICC will also co-host a roundtable with Tsinghua University (China), looking at creative solutions in sustainable development, while Mr Danilovich is scheduled to join former US Vice-President and Nobel Peace Prize laureate Al Gore on a panel moderated by UNFCCC Executive Secretary Christiana Figueres to look at the significant ways in which business and policy entrepreneurs are contributing to the fight against climate change. “Business is an integral part of the climate solution, a top priority for ICC, the world business organization and is high on the 2015 Davos agenda,” Mr Danilovich said. The WEF annual winter meeting in Davos also provides an opportunity for the ICC leaders to engage with thought leaders from the world of business, politics and academia as well as with ICC members and the media.